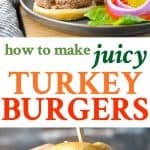 With just 5 ingredients and about 20 minutes, you can serve these juicy and flavorful Turkey Burgers for a healthy dinner any night of the week! 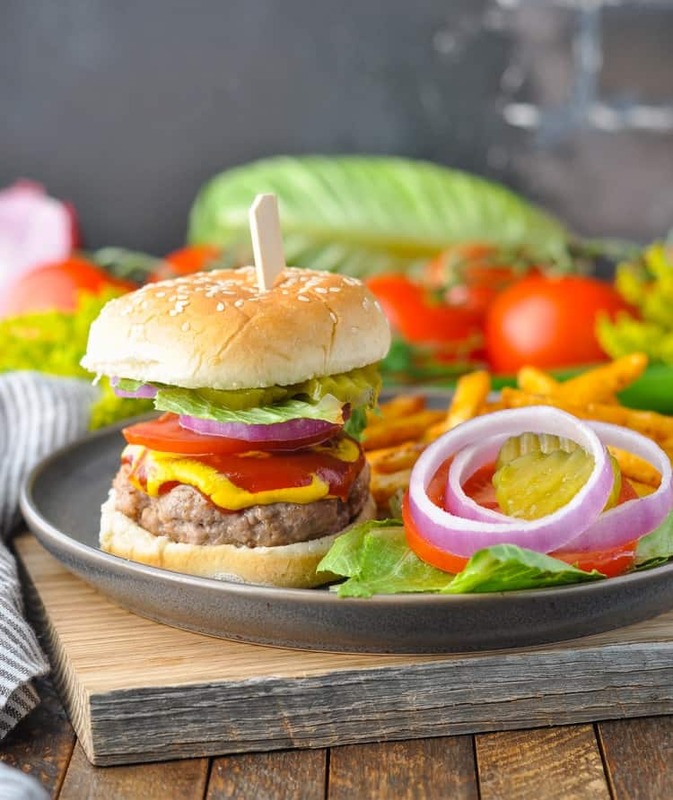 The burgers can be prepared on a grill, in a skillet, or under the broiler for a convenient and family-friendly option on busy days. I live in a house full of classic beef hamburger-lovin’ men. 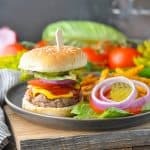 So while I’ve always enjoyed a good turkey burger, I knew that I had my work cut out for me when I decided to tackle homemade turkey burgers for my 4 boys. Let me just get straight to the point: after testing a few different recipes, adjusting seasonings, and running the options by my crew, I can confidently say that these turkey burgers are 100% approved by every single one of the guys in my house. They were even devoured by the 4-year-old who thinks that a McDonald’s fast food hamburger is fine dining! So while they might be light and healthy, they certainly do NOT taste like diet food. they’re one of the few meals that I can serve our entire family without a single picky-eater complaint! 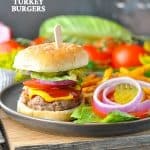 If you want an even lighter option, the turkey burgers taste delicious on top of a salad with tons of fixin’s. I often do this for lunch when I have extras that I just want to reheat in the microwave and enjoy for a quick and satisfying mid-day meal. Best of all, you don’t have to wait until the perfect sunny, Saturday afternoon summer cookout to serve these turkey burgers. I’ve included instructions for cooking them in a skillet and under the broiler, in case the grill just isn’t a convenient option. I hope that your beef-loving friends and family will enjoy these juicy, hearty turkey burgers just as much as mine do! Place all ingredients in a large bowl. Use a fork to gently, evenly distribute the seasonings. Be careful that you don’t overwork the meat, which can result in a dry, dense burger. Divide the turkey mixture into 4 equal portions. Use cupped hands to gently toss one portion of meat into the shape of a loose ball. Flatten into a 1-inch patty. Repeat with remaining turkey to shape 3 more burgers. 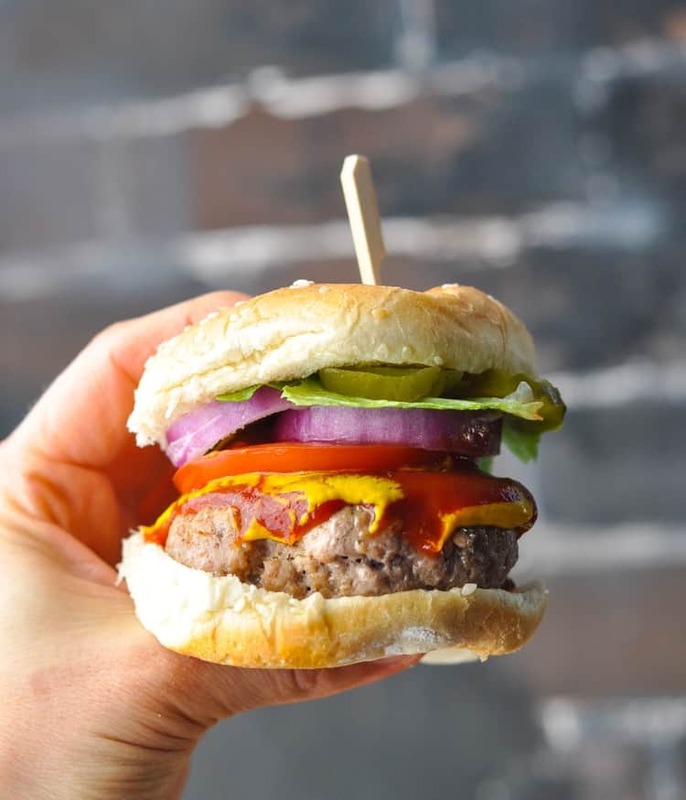 Tip: If you’re cooking the burgers on the grill or under a broiler (where they will be exposed to direct heat on all sides), try pressing a small dimple or indentation in the center of each patty. This will prevent the burgers from “puffing up” during cooking. 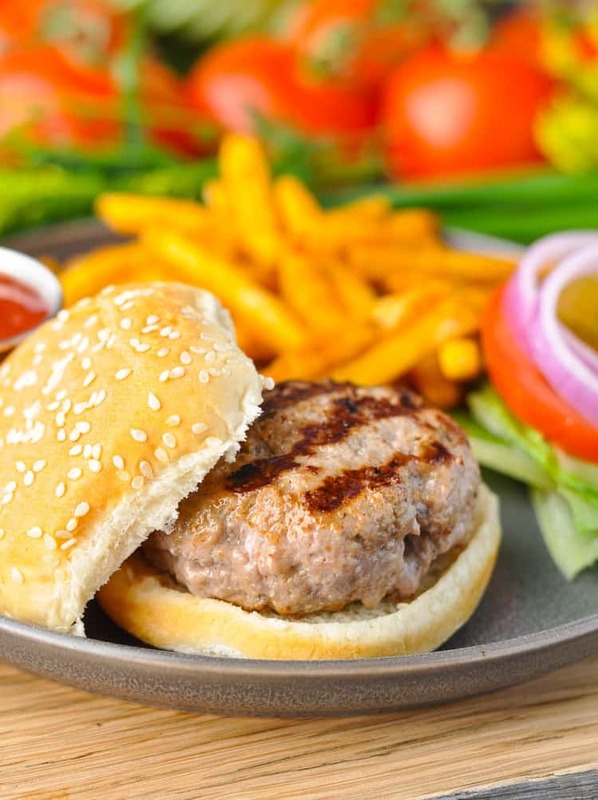 If you’re cooking the burgers in a skillet, the edges and tops of the burgers will not directly touch the heat at any point – and therefore the patties will not puff up. As a result, you do not need to make a dimple in the center of the patty before cooking. Heat 2 teaspoons of vegetable or avocado oil in a 12-inch skillet over medium-high heat. Place patties in the skillet and cook until the bottoms are browned (about 3 minutes). 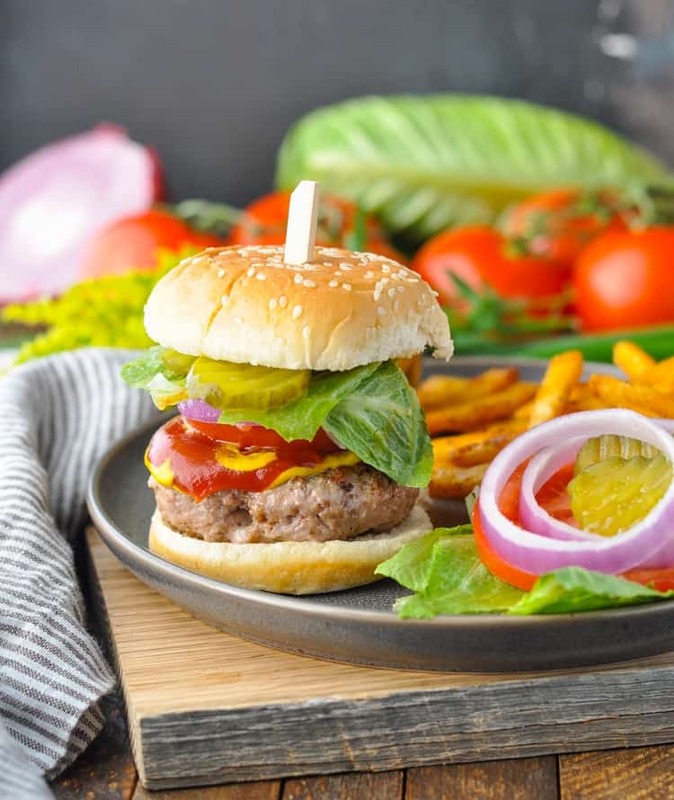 Flip the burgers and continue to cook for 3-5 more minutes, or until internal temperature of the patties reaches 160 degrees F.
Preheat broiler to high. Spray a broiler pan with oil or cooking spray. Place patties on the prepared broiler pan. Broil for 5-7 minutes on each side, or until internal temperature of the patties reaches 160 degrees F.
Heat a gas grill on high. Oil the cooking grate and cook (covered) until burgers are lightly charred and internal temperature of the patties reaches 160 degrees F (about 5-7 minutes per side). *I don’t recommend using 99% extra lean ground turkey breast because it tends to yield a dry burger. Note: This recipe yields 4 relatively small burgers, which I often serve on "slider" buns. If you're feeding a larger family (such as a family of 5 like mine), I suggest doubling the ingredients to prepare 8 small patties. They will disappear fast, and they freeze or keep in the refrigerator really well as leftovers. To Prepare in Advance: You can shape the patties ahead of time and keep them on a tray (or plate) lined with waxed paper, covered, in the refrigerator overnight. You can also freeze individual patties if you prefer. 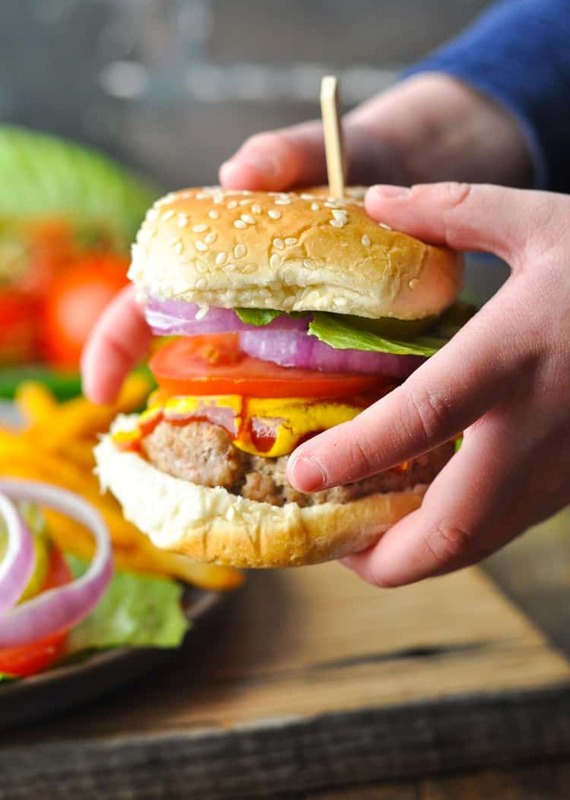 To Cook in Advance: If you want to cook the patties in advance (or if you just have leftovers), the cooked burgers keep really well in the refrigerator for at least 3 days. Alternatively, you can wrap the cooked burgers tightly in plastic wrap and foil and keep them in the freezer for up to 3 months. To Reheat the Cooked Burgers: Microwave a refrigerated, cooked burger on high for about 1 minute. These look so good – and I love that they got the picky eaters tick of approval!! Woohoo! Just made these. They were so moist and delicious. Thanks for the recipe. My husband was recently diagnosed as having the alpha-gal virus, so he had to give up pork, beef and a few other types of meat. I already don’t eat pork and beef was next on my list. So, I’ve been experimenting with different recipes. I tried your turkey burger recipe tonight and it was delicious! He couldn’t believe how good these were because he loves beef. Thank you!